Line the bottom of a bamboo steamer basket with the Chinese cabbage leaves. These will prevent other ingredients from falling through the wholes in the bottom of the basket. Soak the noodles in warm water for 10 minutes to soften. Place 2" of water in a wok or tall pot and bring to a boil. 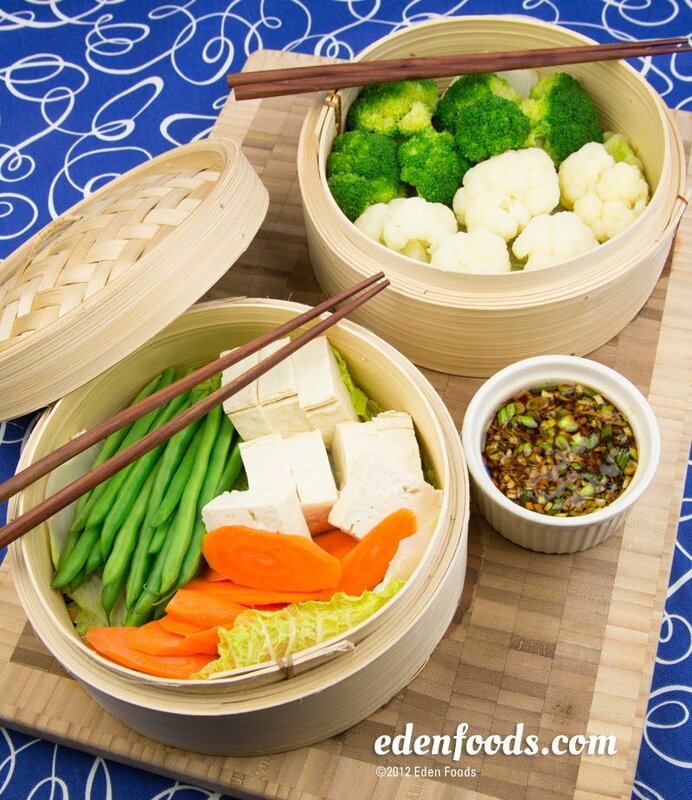 Arrange all vegetables and tofu in the steamer, except the pea pods, keeping each type separate from the others in their own section. Place the mung bean pasta in the center of the basket. Cover the steamer basket and place in the wok or on top of the pot. Steam for 2 minutes. Add the pea pods, cover and steam another 1 to 2 minutes until the vegetables are brightly colored and slightly crisp. Remove the steamer and uncover. Place the basket on a round platter or plate and set on the table. Prepare the dip sauce by whisking all ingredients together. Pour into 5 individual small dipping bowls. Dip the vegetables, tofu and noodles into the sauce before eating. Quick, easy and refreshing! Any type of vegetables, fish or seafood can be used instead of the above. Make sure to slice harder vegetables in similar size pieces so that they finish cooking at the same time. Leafy green vegetables may be added the last 1 to 2 minutes so they do not over cook and loose their dark green color. Eden Kuzu Noodles may be used in place of Eden Mung Bean Pasta. If using Eden Udon or Soba, precook as package directs until al dente and rinse before placing in the basket.